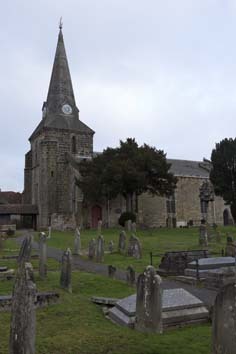 Most dates from a rebuilding in 1839 or is more recent, but the lower tower and some of the chancel are C14 and the origins of the church may have been earlier. 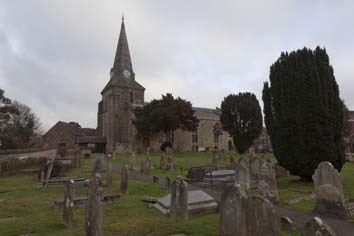 Though Uckfield was an important river crossing, it remained ecclesiastically a chapelry of Buxted until 1839, when the church was rebuilt on account of its previously small size. The chief survival from its predecessor is the C14 base of the tower below a string-course, with the jamb of an otherwise renewed west doorway and a renewed square-headed window. The south wall of the chancel, now behind a vestry, is also mostly C14 with a moulded doorway found in 1932 (1 p90). A plate of the north side before 1839 (3 opp p8) shows a low tower with a pyramid spire and a projection to the east for a clock. In the aisleless nave was a two-light window with a quatrefoil head and two square-headed ones in the chancel had pierced spandrels. All this looks C14, but Nibbs’s etching of the church before it was pulled down (in his 1874 volume and possibly derived at a later date from the one already mentioned) shows a small and indistinct window in the north wall of the chancel between the other two. This could suggest the walling was earlier, perhaps C12. The three-light east window, like the present one, had curvilinear tracery with a distinctive transom beneath the head. Plain post-Reformation round-headed windows in the nave and a triple-arched porch were connected with galleries. The architect of the new church was W Moseley (ICBS) and it was completed in 1840. It is broader than its predecessor, with tall aisles with windows divided horizontally for galleries. The side ones are behind big four-centred arcades, with continuous chamfers. Only the roof is unplastered with thin timbers with pendants that recall the early C17 in style. The panelled fronts of the side-galleries may have been altered, for they differ from the gothic arcading on the west one. 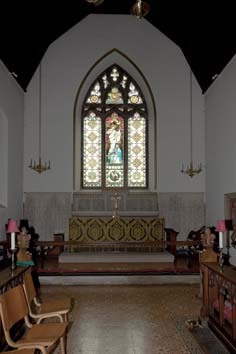 Moseley kept most of the old chancel, so it was longer than usual in the 1830s and the east window was unchanged, though in 1851 Nibbs commented on its shallowness. Moseley added an upper stage to the tower, with a curious double west bell-opening and a broach spire. 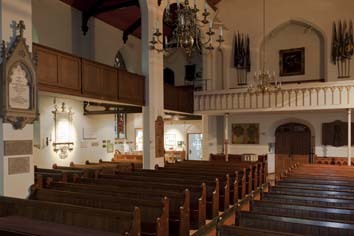 Moseley’s work was poorly regarded in the later C19, though more survives here than in his other churches in Sussex. 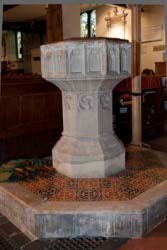 Undated proposals for improvements by Sir George G Scott (Cole p224) were not carried out and the attribution may indeed be an error, stemming perhaps from Scott’s virtual rebuilding of Little Horsted church in the next parish. In 1888 L W Ridge drew up plans (B 55 p93), but in the same year tenders were sought for alterations and a restoration by H Scarlett, described as an architect of Uckfield (ibid p368) but actually a local lawyer. Possibly his plans owed something to those by Ridge. The chancel was extended by 10ft with a new vestry to the south, resetting or copying the east window. An arch across the chancel marks the previous east wall. Some galleries were apparently removed, though they survive on three sides of the nave. At the same time, the entrances on either side were moved further west. Brass: (North chancel wall) John Fuller (d1610), a wealthy ironfounder (Mosse p151). Chandeliers: (Nave) Brass. 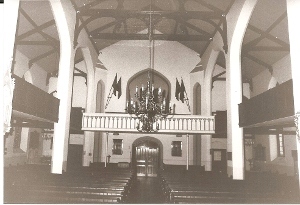 They are C18 in style, but according to an inscription in the church were donated in 1960 and 1976 respectively. Font: C19 with a relatively shallow octagonal arcaded bowl. 1. (East window) J Powell and Sons, consisting of a centre light designed by H Holiday, 1878 and otherwise decorative quarries. 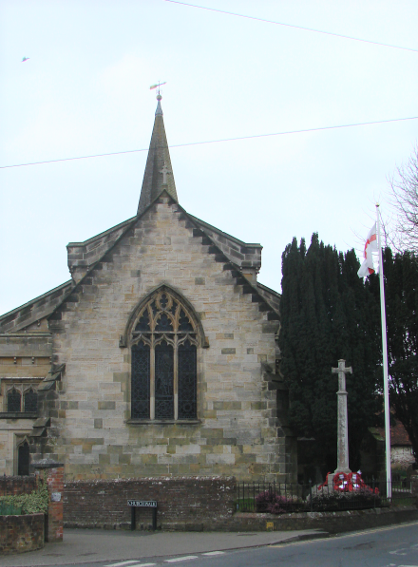 It was moved and reset when the chancel was lengthened (Hadley). 2. (Chancel north window) J Powell and Sons, 1891. It consists of two figures, of which one was designed by Holiday and one by F H Jackson (ibid, though there is no very obvious difference. 3. (South nave first and second windows) J Powell and Sons, 1901-03, designed by E Penwarden (Hadley list). 4. (North nave, first window) J Powell and Sons, 1889, decorative quarries (Order book). 5. (North nave, second window) ‘Messrs Pearce of Birmingham’ (www.stainedglassrecords.org retrieved on 29/3/2013) i e W Pearce Ltd. Dating from 1899 the glass is typical for the date. 6. (South chapel east window) F C Eden, 1932 (ibid, retrieved 16/2/2015), roundels. 7. (South nave, third window) Lawrence and Co, 1992 (signed). This shows the designer’s liking for Victorian glass with intense colours. Monument: (South wall) Gabriel Egles (d1707) Iron tomb-slab.